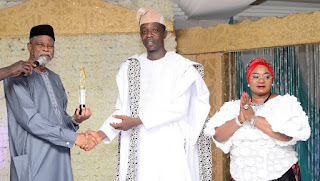 The All Progressives Congress in the state of Osun has sent words of congratulations to Honourable Olatunbosun Oyintiloye on his investiture as the Most Outstanding State House of Assembly Member in Nigeria Award, which held at the Shehu Musa Yar'Adua Centre Abuja on Saturday 2nd December, 2017. The Award acknowledged Hon Olatunbosun Oyintiloye's contributions in law making for good governance and community development. According to APC, 'first, this award stands Osun high in the country's quality legislation category and secondly raises hope for youth participation in the legislative arm of government. For a young first timer legislator to win that award speaks to the dedication and diligence of Hon Oyintiloye, which set remarkable example for youths who may be interested in the legislative process of the future. The party spoke through its Director of Publicity, Research and Strategy, Kunle Oyatomi in Osogbo today. 'The party celebrates your achievement and feels proud that despite your being new in the House of Assembly, you have set a record within two years of participation to clinch the Most Outstanding House of Assembly Member in Nigeria Award. This is a sign of better things to come and the party urges you and other members in the Osun State House of Assembly to keep the Omoluabi flag flying', Oyatomi stated.